The Apex forms the focal point of the new Century City Square. This eight-storey building with dramatic glass exteriors and a unique, curved architectural design, offers corporates the ultimate in sophisticated Century City office space. 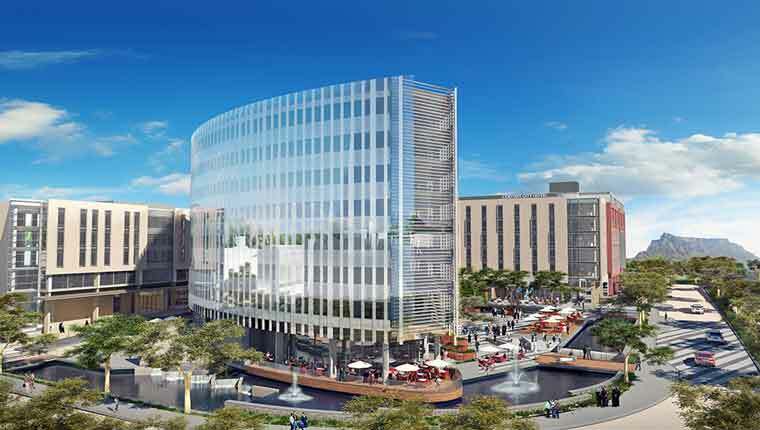 With plenty of convenient parking and the superfast connectivity of Century City Connect’s open-access fibre-optic network, this unique office space is geared to meet the hi-tech demands of modern business in a location surrounded by a plethora of leisure, retail and service amenities. Bordered by cascading waterways and fountains, The Apex has a strong focus on environmentally-friendly, green building design features, and is registered for certification with the Green Building Council of South Africa. This will not only score major corporate ‘greenie points’ but significantly reduce operating costs through energy-efficiency, as well as providing light, people-friendly workspace for that vital HR edge. If you are interested in leasing office space at The Apex in Century City, please contact Jason via email at jason@propertywheel.co.za or complete the form below and we’ll be in touch.